The banking and insurance sectors were severely affected in the state as employees of public sector financial institutions observed a strike in protest against unfair labour practices and anti-worker policies of the government. Members of the Himachal Pradesh State Electricity Board (HPSEB) Employees Union staged a protest to express resentment over the failure of the board management and the government to address issues relating to pension and the deteriorating financial health of the board here today. Tibetan spiritual leader the Dalai Lama today stressed on the medical fraternity to lead life honestly, truthfully, calmly, based on mutual trust, friendship, compassion and self-confidence and avoid indulging in corruption in any form as corruption was a serious form of violence. Entrusted with the mammoth task of leading a faction-ridden party in the election year, it will be a tight-rope walk for Satpal Satti, the newly appointed state BJP chief, considering the escalating fight among the top ranks of the party. Chief Minister PK Dhumal today said the state government had urged the Centre to increase the recruitment quota of the Himachali youth in the armed forces. Speaking at the 12th Himachal Pradesh Gorkha Welfare Board meeting here today, the Chief Minister said since Himachal had a willing population of youth keen on joining the armed and paramilitary forces, the Centre should abolish the “recruitable male population” condition so that more aspiring youth could join the forces. Cold storage units of the state-owned HPMC will be upgraded into modern controlled-atmosphere stores (CAS) before the onset of this year’s apple season. The HPMC has finally awarded the contract to upgrade the cold storage units at Gumma and Jarol Tikker to a Delhi-based company, Infra Cool Private Limited. Solar charkha, driven by solar energy, a first innovation in the Rs 1,000-crore khadi industry that can catapult it to new heights, has hit a roadblock as the Ministry of Small and Medium Enterprises (MSME) awaits approval from Parliament whether or not to allow solar charkhas among artisans. Village-based self-help groups (SHGs) and artisans demand the setting up of a “haat” in tourist towns. They also demand institutional support to make their hand-made products accessible to tourists. These village entrepreneurs are facing an unfair competition from the up-market spurious non-branded plastic products being sold at the mela and in retail. The Department of Mathematics of Government Degree College, Haripur (Manali), is organising a national-level seminar on the topic, “Recent Trends in the Mechanics of Fluids and Solids” from March 10 to 11. It is a fitting tribute to mathematical genius Srinivasa Aiyangar Ramanujan in whose honour this 125th year of his birth has been called the National Mathematical Year. 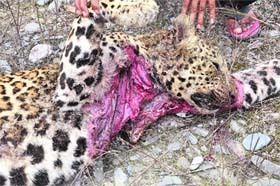 A leopard was found dead in the Naghbagh area in Chambi gram panchayat, 7 km from here, today. The carcass of the animal bore injury marks and some of its parts were allegedly found removed from it. According to information, the leopard fell down from a 100-ft slope and its carcass was spotted in the Naghbagh area of Chambi. Local residents informed forest officials about the incident. Himachal has been chosen for a national-level award for “best tourism promotion” by the Union Ministry of Tourism and Civil Aviation. President Pratibha Devisingh Patil will present the award at a function being organised by the Union Ministry of Tourism and Civil Aviation at Vigyan Bhawan, New Delhi, tomorrow. Senior Congress leader Sanjay Rattan has asked party workers to forget their petty personal differences and gear up to end the “anti-people rule of the BJP” in the state by exposing its wrong and self-seeking policies. He was addressing party workers at a meeting at Jawalamukhi recently. Expressing its concern on the issue of bad condition of roads in the state, the Himachal Pradesh High Court has summoned the Superintending Engineer (SE), National Highway, and Executive Engineer, National Highway, for March 5. The important Chamba-Shimla highway, the only short-cut route to reach the capital city from this distant headquarters town, has not yet been cleared of snow. Chamba is about 450 km from Shimla. The high peaks of Chamba district and its adjacent mountain ranges have been experiencing fresh heavy snowfall since last night, according to reports reaching here today. The Ghumarwin police has registered a case of negligence in treatment against an ENT specialist doctor under Section 304-A, IPC, of a newly started health chain hospital at Ghumarwin town, near here. The banking and insurance sectors were severely affected in the state as employees of public sector financial institutions observed a strike in protest against unfair labour practices and anti-worker policies of the government. However, transport services remained unaffected, while work in some hydropower projects in Shimla was hit as workers of some trade unions joined the protest. Meanwhile, private sector banks and insurance companies functioned as usual. The Centre of Indian Trade Unions claimed that anganwari workers and midday meal workers also joined the strike in the state. The striking workers held rallies across the state and criticised the policies of the Centre. 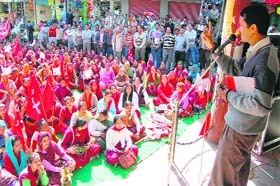 In Shimla, bank employees held a rally near the Scandal Point and transport workers at the old bus stand. Devi Dass, divisional secretary of the northern zone Insurance Employees Association, said the strike was observed across the state. The unions demanded the withdrawal of the Bills seeking to amend the insurance laws and the banking laws and the Pension Bill which they maintained were against the interests of the employees and the people. HAMIRPUR: A large number of financial institutions and several trade unions observed a day-long strike on the nationwide call of trade unions to protest the economic policies of the Central and the state governments and to highlight their demands. Banking operations in many banks and offices of the LIC remained closed as bank and insurance employees did not report to their duties today. However, business in the SBI and private banks was normal. Hundreds of activists of the BMS, CITU and AITUC and employees of the NZIEA, BSNL and anganwari workers held a protest demonstration at the Gandhi Chowk. The activists carrying placards and banners marched through the bazaar from Bhota chowk to Gandhi Chowk and raised slogans against the Central and the state governments. The rally was addressed by CITU leaders Kashmir Singh Thakur and Raj Kumari, Mukesh Kumar of AITUC and BMS leader Rakesh Sharma besides others. Protest demonstrations were also held by CITU activists at Sujanpur and Jahu. The rally at Sujanpur was addressed by CITU district secretary Joginder Kumar. MANDI: In response to the nationwide strike observed by trade unions, anganwari, midday meal and project workers, employees of bank and insurance sectors and a faction of state government employees today staged a protest in this town, demanding implementation of labour laws and job security for them in public sector undertakings (PSUs). Workers came under the banners of four trade unions - CITU, BMS, INTUC, AITUC - and staged a protest rally in this town. They demanded job security and implementation of labour laws in project works and raised slogans against the privatisation of profit-making PSUs and against the failure of the government to control price rise. They also opposed the foreign direct investment in the insurance sector. Later, they submitted a memorandum to the government in this regard. SOLAN: With various trade unions, including AITUC, CITU, INTUC and BMS, giving a call for closing various establishments to press for their demands, banks, various insurance offices and industrial units remained closed today in various parts of the district. AITUC state president Jagdish Bhardwaj said the strike was in protest against various demands, including price rise, lack of implementation of labour laws and enhancement of minimum wages to Rs 10,000. A large number of industrial units in Solan and Sirmaur districts had to suspend their operations as workers observed a day-long strike. Offices in Solan town wore a deserted look as there was an electricity cut on account of maintenance work. A rally was later taken out by trade unions at Solan where slogans against the Union Government were raised. The rally that started from the Solan bypass to the Chowk bazaar later culminated in a public meeting at Ganj Bazar here. Private sector banks and insurance companies functioned as usual. 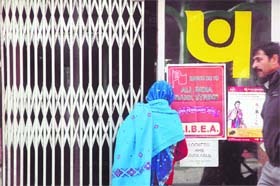 NURPUR: Following the one-day strike by trade unions, functioning in offices of the BSNL, LIC and nationalised banks remained paralysed on Tuesday causing inconvenience to consumers. Employees having affiliations with different trade unions held protest demonstrations on the premises of offices against the anti-worker policies of the Centre, foreign direct investment in retail and privatisation. Meanwhile, hundreds of anganwari workers and helpers also took out a procession in the town to protest against rising prices, corruption and anti-workers policies of the government. Led by Nirdosh Sharma, vice-president of the Kangra District Anganwari Workers’ and Helpers Union, the workers raised anti-government slogans. They also raised demand for declaring anganwari employees as government employees. KANGRA: Operations in public sector banks in Kangra and Dehra subdivisions was affected due to the day-long strike call given by a section of bank unions to protest against outsourcing of non-core activities to the private sector, among other things. Most of the PSU bank branches here remained closed as majority of the clerical staff abstained from work. The strike by bank employees was part of the one-day nationwide strike, called by major central trade unions. Bank unions also protested against the unilateral imposition of the Khandelwal Committee recommendations with regard to human resource issues and outsourcing of jobs. Some protesting employees held a protest on the Dharamshala road outside the State Bank of Patiala in this town. The unions termed the strike as “complete and peaceful”. However, leading private sector banks remained open. A huge rush was seen at ATM centres in the noon but later in the day these ran out of cash. 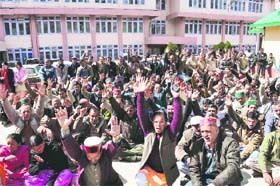 Members of the Himachal Pradesh State Electricity Board (HPSEB) Employees Union staged a protest to express resentment over the failure of the board management and the government to address issues relating to pension and the deteriorating financial health of the board here today. Employees held a gate meeting at the Vidyut Bhawan Complex where the headquarters of the board is situated. Addressing protesters, general secretary of the union Hira Lal Verma demanded the immediate holding of a regular meeting between the management and union representatives to discuss various demands already submitted to the management. They demanded the withdrawal of the government decision to sell BBMB power to the board at average power purchase cost instead of the existing bus bar rates, which would put additional burden on the board and its consumers. It urged the government to put in place a mechanism for the disbursal of pension, gratuity and other such facilities. The electricity tariff should be approved in such a way that the gap between revenue and expenditure was minimised. Further, the entire amount of arrears on account of increase in the power share from the BBMB in the wake of the Supreme Court verdict be provided to create an Employees Pension Corpus. Their other demands included the immediate release of arrears of pay revision and other financial benefits, raising the house rent allowance to 10 per cent of the basic pay and enhancement of ex-gratia to Rs 10 lakh on the pattern of successor entities of the erstwhile PSEB and the recommendation made by the Fifth Punjab Pay Commission. It warned that in case the demands were not accepted, it would be forced to mobilise the 13,000 pensioners to launch a statewide stir. HAMIRPUR: The HPSEBEU today held a protest demonstration at the HPSEBL office, Annu, to highlight their demands. Hundreds of employees participated. The union is demanding reconvening of a regular meeting of the union with the Board, urging the state government to give Rs 4,400 received as royalty from the BBMB to the HPSEBL to settle their pension claims and regularisation of employees etc. The union leaders have also decided to hold a state-level demonstration on March 15 at the state headquarters of the HPSEBL. NURPUR: Members of the HPSEB Employees Union, Nurpur zone held a gate meeting against privatisation in the board on the office premises of a senior executive engineer here on Tuesday. Presiding over the meeting, Roshan Singh Minhas, state vice-president of the union, demanded the disbursement of dues of revised pay scales, 9-16 promotion scales, advance promotion scale of 23-year period and mobile allowance to board employees on the pattern of their counterparts in Punjab. Minhas urged the Chief Minister to convene a meeting with union representatives to settle other long-standing demands to appoint clerks and T-mates and regularise the services of daily wagers and contract employees. He said the union office-bearers would stage a dharna at Shimla on March 15. 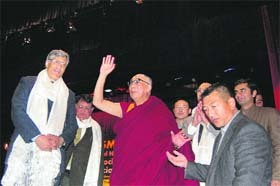 The Dalai Lama was addressing the delegates of the Annual National Conference of Indian Association of Preventive and Social Medicine (IAPSM) on its second day today at the Sobha Singh Auditorium of Dr Rajendra Prasad Government Medical College (DRPGMC) in Tanda in which more than 700 doctors from India and abroad were participating. He was speaking on “Healthy Body and Healthy Mind”. The Tibetan spiritual leader predicted that India would be a “good role model” for the entire world by the later part of this century and the youth of this country would shoulder the responsibility with honesty, self-confidence and dedication, but he would be no more to see it as he was already in his late 70s. In a lighter mood, the Dalai Lama pointed towards senior delegates of the conference that they too would not be alive to see that Indian achievement. He honoured senior conference delegates, including Principal, DRPGMC, Tanda, Anil Chauhan and Dr AK Bhardwaj, oragnising secretary of the conference. Many sessions were organised today on topics like “Integrated Management of Severe Acute Mal Nutrition”, “HIV/AIDS” and “Public Health Challenges” in the context of climate change and epidemiological transition under the aegies of UNICEF and WHO. “The council is yet to recover Rs 1 crore as shop rent from defaulters in the town and efforts are on to recover the remaining amount,” she added. EO of the council Urvashi Walia said the clerk had been placed under suspension and Rs 8 lakh had been recovered from him. However, he later committed suicide and the council had informed the department about it, she added. Walia said there were many EOs who served the council from 2006 to 2010. “We are not aware about the Vigilance case,” she said. The biggest challenge before Satti, who will formally take over the reins of the party here tomorrow, will be to forge unity among the warring Shanta and Dhumal factions. With the Assembly poll barely a few months away, quelling bickering and the rising dissidence will prove an arduous task for a young leader like him. “The biggest challenge before me is to take everyone along and forge unity so that we can reap the dividends of the good performance of our government and register victory in the Assembly elections,” said Satti. He is candid enough to admit the differences among some leaders and feels that it is the single mantra of “unity” which can help the BJP romp home comfortably. Even as Satti’s endeavour will be to ensure that senior leaders sink their differences and work unitedly for the success of “mission repeat”, doubts are already being cast about Shanta loyalists staying away from his formal takeover function at the state party headquarters here tomorrow. While Chief Minister PK Dhumal and his ministerial colleagues are likely to be present, former Chief Minister and Rajya Sabha MP Shanta Kumar will not be present. “I had requested Shanta Kumar to grace the occasion, but since he is away on a tour of the North-East, he may not be able to make it tomorrow,” said Satti while underplaying the senior leader’s stance of staying away from the state party affairs. Having specially been chosen to head the party at a time when not only have some BJP leaders floated a separate political outfit, but there is also rising dissidence, he is faced with a stiff challenge. “I have sought the blessings of both Dhumal and Shanta Kumar and want to take everyone along,” he asserts. On the formation of his new team, he said it would be done within 10 days in consultation with state and central leaders. “We already have a good team, but I would like to induct some new faces, both young and experienced, so that we have a blend of both to ensure a winning combination in the poll,” he said. He said he would activate the party organisation and ensure that everyone took their responsibility seriously and performed well. He said the state government had already relaxed physical standards for the youth belonging to the Gorkha community for recruitment in the police force. He said the government had provided Rs 20 lakh for the beautification of Major Durga Mall and Capt Dal Bahadur Memorial at Dari in Dharamsala. Later, addressing the 11th meeting of the Labana Welfare Board, Dhumal said the government was providing 12 per cent reservation in direct recruitment to Class I and II posts and 18 per cent for class III posts to candidates belonging to Other Backward Classes in government jobs with a view to providing them more employment opportunities. Sarveen Chaudhary, Social Justice and Empowerment Minister, said interest-free loan to the tune of Rs 165.8 lakh had been disbursed among 86 beneficiaries through the Other Backward Classes Finance and Development Corporation. She said 77,817 new social security pension cases were sanctioned during the past four years. The public sector undertaking had to invite tenders thrice for the purpose. In the first instance, the bidders failed to fulfil the technical parameters and the second time the bid was not accepted as the “chamber load” was on the higher side. In the final tenders, there were three bidders and the bid of Infra Cool, which quoted Rs 2.40 crore and Rs 2.50 crore for the two projects, was the lowest. Each cold storage will have eight chambers of 100 tonne capacity each and the aggregate capacity of the two cold storage units will be 1,600 tonnes. The company will install a refrigeration plant and complete the work by July when the harvesting of apple commences. The multi-chamber cold storage units will enable staggered marketing of the stored fruit, which can be kept in a good state for more than a year under the controlled conditions. Besides, other perishable produce like vegetables and other fruits can also be stored along with apples. The modernisation of packaging and grading houses at Gumma, Jarol Tikker and Patlikuhl is also under way at a cost of about Rs 8 crore. With the availability of these state-of-the-art facilities, the HPMC will be able to procure a large quantity of high-quality fruit, store it without loss of quality for a long time and sell it at a premium, choosing its own time. Funds for the modernisation of the cold storage units and grading houses have been provided by the Agricultural and Processed Food Products Export Development Authority. In all, it has sanctioned about Rs 30 crore for various projects, Besides packaging and grading houses (Rs 8 crore) and CAS (Rs 10 crore), it has also sanctioned about Rs 11 crore for integrated units for fruit, vegetables and flowers at Ghumarvin and Nadaun and a tetra-pack unit at Parwanoo. The ministry is in a fix whether to accept “solar charkhas” as a modern substitute for the traditional hand-driven charkhas. But even after 65 years of Independence, khadi could not grow much as its share remains just below one per cent in the country’s weaving and fabric industries, said officials. Over 90 per cent of weavers involved in weaving khadi fabric and yarn were women. The production had hit Rs 700-crore mark and its sale was worth Rs 1,000 crore in the country as a whole, he added. Though khadi cotton was the best cotton, its acceptability in the country remains poor. Over 90 per cent of people do not understand that khadi cotton was the best natural cotton and its fabric was the best, the officials said. The reasons were not hard to seek. Acrylic fabrics, which have ushered in a fabric of mass taste, were much cheaper and more fashionable as compared to khadi, they said. The khadi industry so far has failed to create mass markets and appeal in the country as its fabric remains coarse and it lacks “innovations and value additions”. Besides, the KVIC has set up a network of emporia, research and development and value additions to increase its share and create niche markets in the country and abroad. The ministry has been popularising solar charkhas in various exhibitions, fairs and festivals across the country. The KVIC has been bombarded with queries from weavers and artisans demanding the launch of solar charkhas. Solar charkhas, which developed at the Mahatma Gandhi Institute for Rural Industrialisation and cost Rs 25,000 a piece, can boost production in the country. “A weaver can earn Rs 150 to Rs 200 per day as compared to Rs 50 to Rs 100 he earns while working on the tiring hand-driven charkhas,” the officials added. Meanwhile, Union Minister for Micro, Small and Medium Enterprises Virbhadra Singh said the issue had been put before the government to seek approval under the Khadi Act and it might involve amendment. Talking to The Tribune on the sidelines of the Saras Mela at the ongoing International Mahashivratri fair here, they rue that the successive governments have failed to provide them marketing facilities in tourist towns like Manali, Shimla and McLeodganj. Foreigners and high-end domestic tourists frequent tourist towns and they get a good price for their products from them. “The future of village artisans is insecure as we neither have a training support nor any ‘haat’ to sell the products to tourists and other customers,” says Vijay Mehra, a craftsman from Makroti, Shahpur, Kangra, who runs a stall outside the Saras Mela. He says he pioneered crafty bamboo products in 1998, but still he is finding it difficult to make a living out of it. “I want to teach it to others, but the government has no skill-development institute for promoting handicrafts,” he says. Vijay and his brother Pankaj depend on the sale of bamboo products, viz bamboo lamp shades, dream houses, flower pots etc. “I do not get a stall in the main Saras Mela as some machine-made goods are on display at the mela,” he resents. Kehar Singh, Kurmi Ram and Daya Ram, who also come from BPL families from Bali Chowki tehsil, rue that they do not find stalls at the Saras Mela. “We always get a raw deal from the mela committee as we are charged Rs 2,000 or more every year,” they complain. They say they are traditional artisans selling hand-made products and agricultural implements to farmers. “We should be given free stalls as the committee pays money to devis and devtas. Then why do they charge poor people like us?” they ask. The SHGs and village artisans face an unfair competition from plastic wares and other machine-made products like baskets, kitchen and drawing rooms products, sculptures and idols of devis and devtas from different metals. 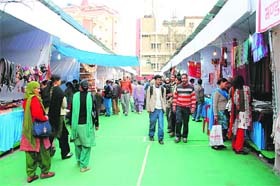 “There are BPL groups who are running stalls in the Paddal Maidan, but they have availed free accommodation from the mela committee under the Saras Mela,” complain artisans. DRDA’s assistant administrative officer Sarojana Thakur, in charge of the Saras Mela, says they have put up over 75 stalls giving market facilities to over 150 Below Poverty Line (BPL) families and SHGs representing 15 states. “We are also launching skill-development programme to artisans,” she adds, denying any misuse of Saras Mela facilities. The basic objective of the seminar is to provide a platform for academicians, scientists, engineers and researchers to discuss the recent advances and trends in various fields of fluid and solid mechanics. Nowadays, degree colleges of Himachal Pradesh are also trying their best to provide such platforms. Convener of the seminar Dr Sanjay Kango,Assistant Professor of Mathematics, said renowned Prof Timothy A Gonsalves, Director, IIT, Mandi, had consented to inaugurate this academy festival at Atal Bihari Vajpayee Institute of Mountaineering and Allied Sports, Manali, on March 10. He further said about 100 delegates were coming from all corners of the country like the Bhaba Atomic Research Centre, Mumbai, IIT, Delhi, NIT, Hamirpur, Himachal Pradesh University, University of Calcutta, Visva-Bharti Santiniketan, Kolkata, Jadavpur University, Kolkata, Panjab Unuversity, Chandigarh, Kurukshetra University, NHPC and various colleges and institutions and would give lectures and present their research work. He said it was really difficult to host such a big academic event in a college having single faculty. But the full credit went to the team led by Dr PP Kaishta, Principal of the college, who was leaving no stone unturned for the successful conduct of this seminar. Some persons removed the flesh and claws from the carcass before it was taken into custody by officials of the Forest Department. As per belief these parts of the animal are stated to be useful for some religious ceremony, residents of the area said. Later, its autopsy was conducted at Veterinary Hospital, Sundernagar. The autopsy report said it had suffered a chest injury, one of its legs was fractured and some claws were missing. It had died because of shock due to haemorrhage. It was further revealed that the injury could be accidental. According to DFO, Sundernagar, Ajit Thakur as per information received by him he did not see any possibility of poaching or killing of the animal. However, it was revealed by the staff that some people tried to damage the body with sickles and some of its nails were found missing. He added when the autopsy report would be received further action would be taken, and if it was found that some of its parts had been removed, a case under the Wildlife Protection Act would be registered against culprits. He said the carcass was consigned to the flames in the presence of a committee constituted under the provisions of the Wildlife Protection Act, headed by the ACF, Sundernagar. Residents of Chambi said the carcass of leopard was recovered from the area which has been wrongly leased out to Harish Cement Ltd without complying with the provisions of the Forest Conservation Act. The award will be received by Manisha Nanda, Principal Secretary, Tourism, and Arun Sharma, Director. An official spokesman said here today that the award was being given for the quality production of tourism-promotion literature and print media and electronic media campaigns, which had contributed significantly to attracting tourists. “Har Ghar Kuchh Kehta Hai”, “Har Gaon Ki Kahani” and “Monal”, the quarterly departmental magazine, along with other quality literature on different tourism activities and “Unforgettable Himachal”, a promotion capsule on a channel, had been considered as “best promoters” in giving a boost to tourism in the state. Rattan asked the workers to expose the “failures” of the BJP on all fronts. He alleged that bus fares had been increased by the present BJP government by 45 per cent, electricity tariff by 45 per cent and drinking water tariff by 33 per cent, thus putting common people of this hill state in the dock. He accused the Dhumal government of violating and misusing Section 118, HP Agriculture Land Act, to oblige those who were close to politicians in power. He alleged that the BJP had virtually sold the state to outsiders. A Division Bench comprising Chief Justice Kurian Joseph and Justice Dharam Chand Chaudhary passed this order on a Public Interest Litigation filed in this regard where in issue of bad condition of roads was raised. It was further alleged that there were many roads in the state which were not motorable and in a bad condition. The local residents are facing major issues related to transportation due to the bad condition of roads. The Chamba-Shimla shortcut highway via Jot pass was blocked by heavy snowfall in the first week of January and even after about two months the snow on the highway has not been cleared. It is only a patch of the highway near the Jot pass which is covered under heavy crisp snow. All the bus routes which ply via the Jot pass itinerary are being plied via the Banikhet-Lahru route. Meanwhile, the state government has pressed into service the workforce of the PWD to remove the snow from the highway and resume vehicular traffic as soon as possible, officials said. They claimed that the work to clear the snow and restore the highway was in full swing. Transportation on this road would be possible by next month, they added. The reports said the lower areas had been having widespread rain accompanied by thunderstorm. All the passes along the high peaks such as the Jot Pass, Jalsu Pass, Kugti Pass, Chobia Pass, Chehni Pass, Padhri Pass and Saach Pass continue to remain closed. Residents are facing numerous difficulties putting their normal life out of gear. Officials, however, said the essential commodities and food items had already been stocked in abundance in snowbound terrains. The Ghumarwin police has registered a case of negligence in treatment against an ENT specialist doctor under Section 304-A, IPC, of a newly started health chain hospital at Ghumarwin town, near here. A patient, he was said to be treating for the past few days, is said to have suddenly died during the treatment at this hospital yesterday. Reports said Kamlesh Kumari, wife of Rameshwar of Lakhettar village under the Kapahada area, near Ghumarwin, was under treatment due to some problem in her ear and was repeatedly visiting the hospital for treatment. She came for the third time as follow-up of her treatment yesterday. The doctor concerned is said to have prescribed some injections to her which were given by a nurse of the hospital at the hospital itself, but her condition suddenly deteriorated and she died immediately, despite all attempts of the medical staff to save her. Relatives of the woman who were accompanying her alleged that Kamlesh Kumari died due to negligence of the doctor concerned and they got registered an FIR in the police station against the accused.